This week, CES 2018 descended upon Las Vegas, while at the same time, another industry show, the Kitchen and Bath International Show (KIBS), brought all sorts of innovation to Orlando, Florida. Appliance makers such as GE and Samsung were split between the two, but there was at least one trend that united almost every manufacturer we saw at either show: guided cooking is coming to your kitchen. Only a few years ago, “guided cooking” was relegated to countertop smart appliances and accessories that could take amateur chefs through every step of a recipe. Through the use of apps or built-in touchscreens, the Hestan Cue, Thermomix, and Drop Kitchen Scale helped cooks by setting themselves to the right temperature, automatically stirring contents at the right speed and duration, and giving exact measurements far more accurate than a measuring cup could. While smart fridges, ranges, and ovens have been on the market for years, they’re just now catching up with what putting connectivity in a major appliance might mean for busy people. In addition to Wi-Fi, manufacturers are also adding full-color touchscreens, like the new GE Profile wall ovens, which have a 7-inch LCD touchscreen. The promise has always been that someday your fridge will be able to choose a recipe for you based on your preferences and the groceries you actually have stocked inside, then send it to your oven for preheating, while on one of your many screens, videos play to help you master unfamiliar techniques. According to companies such as Whirlpool, we’re practically there. Whirlpool has acquired Yummly, an app that finds recipes based on your likes and dislikes, as well as skill level and time commitment. At CES 2018, Whirlpool announced that Yummly 2.0 will integrate with some of its smart ovens. The new version of the app has improved image-recognition technology so it can take an inventory of your food and order anything missing from Instacart. Tutorials and videos are integrated into the app, which can also send instructions to a connected oven or microwave. If your recipe calls for two cups of water, it can send a message to your smart fridge, which will dispense just the right amount when you’re ready with your cup. Lots of appliance makers announced similar integrations with different apps at CES or KBIS this year. 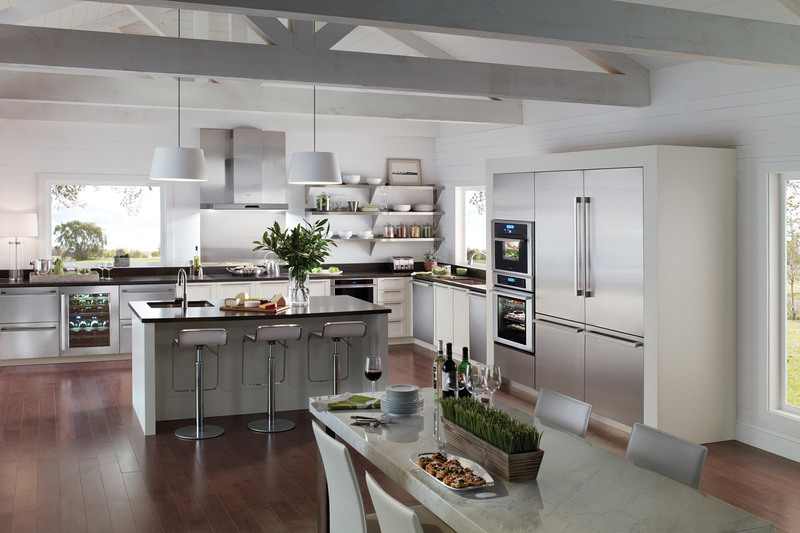 Bosch said its smart Home Connect appliances — including those from Thermador — will soon get a boost from food platform Kitchen Stories, which the company acquired. Similar to Yummly, it offers how-to videos and detailed instructions, and will be able to send heating instructions to smart ovens. Meanwhile, LG is pairing with Innit and SideChef for its connected appliances. Innit, a platform that wants to “digitize food” to help make it easier to track it from its source to your home, then assist you with cooking it, has already partnered with Bosch and GE. Not only will SideChef’s app read aloud its directions for you, it wants to help even those who are afraid of the stove learn to cook, so it will teach you how to boil water, if you need that level of help. A lot of this lends itself to voice-assistance integration, and you may also be able to ask Amazon Alexa and Google Home to help you through some of these steps, based on what appliance you have. Amazon would love you to use its Echo Show as a kitchen assistant, so you can view videos and ask Alexa to read you through the steps. GE announced its own vision of a cooking-centric screen at CES: a Kitchen Hub that goes above your stove. Not only does it work with Alexa and Google Assistant, it acts like an Echo Show in that it plays videos, lets you listen to playlists, and controls Zigbee and Z-Wave smart home devices. Samsung and LG put their hubs into fridges with screens and voice control. With something like GE’s PT9051SLSS and PT9551SLSS wall ovens, the idea of guided cooking is a bit more oven-centric. On the touchscreen, you can choose the “precision cooking” option, and it will take you through the rest. Let it know what type of food you’re cooking (meat, vegetable, bread, and so on), and it will drill down into the category, figuring out preferences for how well done you’d like your steak, for example. From there, it will tell you which rack to put it on and what type of pan to use. This may not appeal to a seasoned chef (and they have the option of using it like a regular, old oven), but it could certainly help some novices. 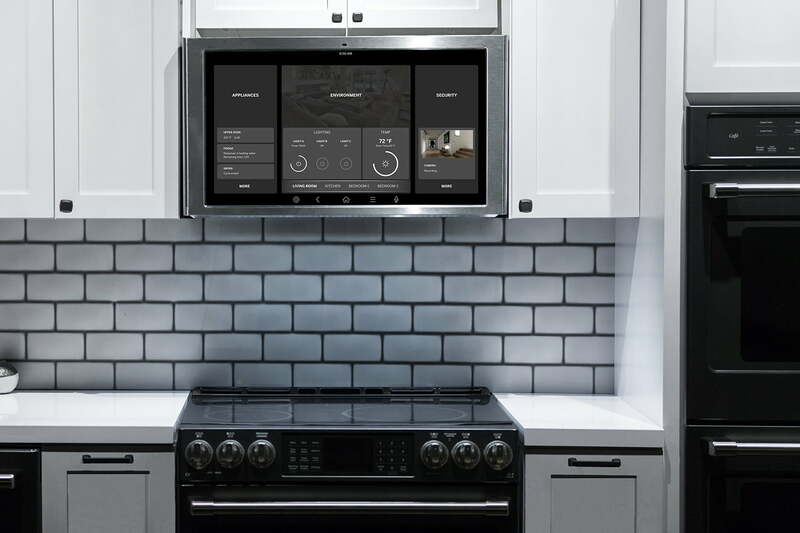 After launching with a couple hundred recipes, GE can push new ones to the oven via an update over Wi-Fi. You may think it’s pointless to have an oven that sets itself to 350 degrees Fahrenheit, but the real benefit comes with multistep cooking. Even if you’re just heating up a frozen pizza, Whirlpool says you’ll get a benefit from its Scan-to-Cook feature; use the app to scan the barcode, and it will ask you if you prefer your pizza chewy or crispy. Either way, it will send the exact directions to your smart oven. If you do want a crispier crust, the oven will automatically turn the broiler on for a bit at the end to blast the pizza from above and make it a little browner than usual — all without you having to do anything. Imagine what a smart oven can do for something more complicated. Innit has said it can cut the cooking time for ribs from 3.5 hours to 58 minutes by changing the temperature in an oven several times in the same way a professional chef would. Unless you’re making a frozen meal, cooking is going to involve more than just your oven or microwave. That fact has behooved smaller devices to partner with appliance makers; the Drop scale works with GE, for example. But it also benefits the appliance makers to be open to Amazon and Google, as well as platforms such as Innit. Right now, the sticking point in the connected kitchen experience is the stovetop. Controlling the temperature in your oven is one thing, but controlling the burners on top is another. Until appliance manufacturers start making connected cooktops, there’s a stopgap of products such as FirstBuild’s Paragon, the Hestan Cue, and Buzzfeed’s Tasty One Top — all connected induction countertop cookers. It’s one reason why Frigidaire’s upcoming freestanding induction range is so exciting — it will cost under $1,000, when all others on the U.S. market are over $1,500. And while small appliances have roles to play in the connected kitchen, too, we expect to see more integration from food producers to push forward a more fully integrated kitchen first. Amazon is pushing its Dash Buttons and replenishment services as ways of keeping tabs on your groceries, and pretty much every connected fridge we saw at KBIS this year had cameras inside to let you check whether you have orange juice via an app while you’re at the store. Samsung says the new version of its Family Hub fridge will have a better meal-planning app that takes into account what you have on hand. But inventorying it all is still a bit of a pain and focusing on the fridge ignores what’s in your pantry. There are solutions such as connected canisters, but they’re pricey and the experience isn’t seamless or integrated enough to make it a game changer. While all these appliances might excel at helping you make individual dishes, actually making a whole meal is still a bit of a challenge. Ideally, you’d have one app that tells you how many onions to cut for all three dishes you’re making, not just the first one. And then it would let you know to preheat the oven for the roasted vegetables, even though you’re actually browning the meat for the pasta sauce. There’s a lot of potential for meal kit delivery services here, which do this in written form on the included card for a single night’s meal. It might also alleviate some of the grocery integration headaches, as they deliver exactly what you need for a specific number of dinners, so you don’t have to worry about the extra broccoli going bad in the crisper drawer. Chef’d is one such meal delivery service, and it’s already partnered with SideChef; it wouldn’t be too far of a leap for it to extend that to LG and have its ovens primed for instruction when you’re ready to start cooking the kit. It’s not quite the era of the connected kitchen, though it is on the horizon. It seems like we’re almost at a tipping point where it’s harder to find an appliance without smart technology than to find one that has it built-in. From a manufacturer’s standpoint, it makes sense: They can deliver improvements via over-the-air updates, get data about how you’re using the appliance, and troubleshoot problems before sending out a repairperson. And while some of the features may be exciting or intriguing to busy parents or reluctant cooks, people have concerns, especially over safety — and not just the potential for hacking. “I don’t want my toddler telling Alexa to turn on my oven,” someone told us at KBIS.